Octopuses are masters of disguise and can modify textures, colors and patterns of their skin in order blend with the surroundings and so also to communicate with one another. It has been revealed that octopus skin contains pigments which are normally found in the eyes. This makes it sensitive and responsive to light. Octopuses have been known to rely on their vision in order to change color. It is a known fact that Octopuses are color blind. However they can use their eyes to sense colors in their surroundings. Octopuses relax and contract their chromatophores. Chromatophores are bags of color pigments. It can take any of the 3 basic pattern templates to merge with their surroundings. The process is ultra fast and takes only a fraction of a second. It was proved way back in 1960’s that chromatophores react to light and this implies that it can work independently without any input from the brain. Researchers associated with University of California took a few samples of skin from a species of octopus known as California two spot. The samples were place in a Petri-dish with the aid of insect pins. Light emitting diodes were used to shine lights of varying wavelength onto the sample skin. It was revealed that when the skin was exposed to continuous bright white light, the chromatophores expanded and pulsated rhythmically. On being exposed to red light the muscles contracted rhythmically but did not expand the chromatophores. 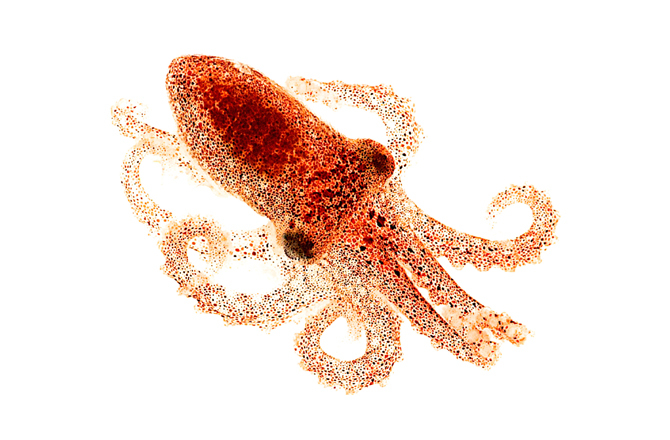 Octopuses are not the only animals which have light sensitive pigments in their skin. A number of other species which have special pigments containing opsins in their skin are also sensitive to light. Researchers had earlier suspected that cephalopods have a neural mechanisms initiated by the mind which controlled the shade of their skin. However now we know that environment has a lot to do with the ability of octopus to change color and hues. Chromatophores are bags of color pigments. These work best on our arms as part of our skin (muscle interactions). However it’s best not to put them on our heads as our babies will be born with alien-style heads! too dramatic? maybe but it’s real!